It is always believed that getting funds for your business idea is the major task to kick start with as money is the major aspect through which things get executed. It is always believed that there is loads of money rotating in the market, of course–there always is–but how to focus on the perfect target is something which changes the complete story. Bootstrapping refers to raising the funds through self-sources which include one’s savings, family or friends. In other words, funds which are not raised by any other external sources are collectively known as bootstrapping. But it is beneficial only in case of ideas which involve low cost & the investment is required at later stages. Businesses which incur a cost from the first stage can’t be taken into this category. Crowd funding involves funding of a project or venture by raising monetary contributions from a large number of people. It is a form of crowdsourcing of an alternative to funding raising from the investors or the VCs. It works in the following manner– An entrepreneur will present a detailed description of his business on some of the crowdfunding platforms. The vision & mission of the business along with the approach, investment & the output in the form of profit need to be well mentioned in the detailed presentation. Convinced people from the crowd will make certain promises like pre-buying the product or investing into the idea presented to them. The only consideration to be kept in mind is that being a crowd funding process, one should be pretty sure about the idea, product or the service as this sort of platforms are too competitive in nature. Entrepreneurs looking out for comparatively lesser funds for their start-up can approach to the angel investors. Networking is crucial for such processes. As you need to find the perfect angels who have good hands on the related industry & can show faith & confidence to the idea filled with passion. These segments of fund providers are experts in their own genre with high standards of professionalism & extremely well informed about the domestic as well as international markets. Entrepreneurs who have just commenced with their idea should not think about reaching to a venture catalyst until & unless it starts generating the good handsome amount of revenues, along with customer base, market acquisition & a decent valuation. 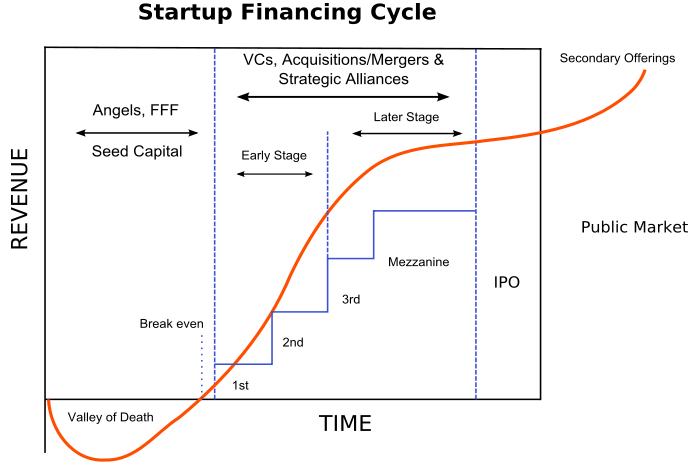 VCs focus basically on 2 scales- Revenue & the exit strategy which means if the investment is done today then what will be the valuation of the startup 2–3 years down the line & what will be their exit plan in case of mergers & acquisition. Typical VCs work on the business model of holding equity & stake which means they also involve themselves in decision-making & other related stuff. So, if you are hesitant to their decision making in your start-up then this would not be an option for your fundraising. Through this idea, a few funds can easily be raised by the participating audience. It can be done through the organizing of events, celebrity involvement, selling the tickets for the in-house sports & competitions, series of tournaments etc. In such competitions, you either have to build a product or prepare a business plan which can be easily pitched. A lot of media coverage does happen in such events as well which helps in getting publicized among the crowd. Some of the popular startup’s contests in India are NASSCOM’s 10000 startups, Microsoft BizSparks, Conquest, NextBigIdea Contest, and Lets Ignite. Getting loans from the banks is the best way of raising funds. Although it also involves certain regulations like you need to validate your revenue which means you should be able to convince the bank of paying back of the loan within the mentioned tenure. Micro financing is something which is a real hype as it has involved government interest as well. It deals with providing the funds to smaller ideas majorly in tier 2 & tier 3 cities. NBFCs, as well as the nationalized &private sector banks, are taking a huge interest in this untapped section. An initiative has been taken by Government of India has launched 10,000 Crore Startup Fund in Union budget 2014–15 to improve startup ecosystem in India. The government has launched ‘Bank Of Ideas and Innovations’ program. Schemes by Government like ‘Pradhan Mantri Micro Units Development and Refinance Agency Limited (MUDRA)‘ benefits to around 10 lakhs SMEs. The entrepreneur is supposed to submit your business plan and once approved, the loan gets sanctioned. A MUDRA Card is given, which is like a credit card, which you can use to purchase raw materials, other expenses etc. Shishu, Kishor, and Tarun are three categories of loans available under the promising scheme. Such schemes are now also launched by many of the state governments for improvising on the start-up scenarios. The partnership works out well for an entrepreneur as a lot many things gets shared which includes the idea, experience of a more established organization, work force, and networking & at last risk of losing on the business or the market. It helps in reducing the cost which helps in monetary terms being the biggest issue for an entrepreneur. Product pre-sale can be a way of getting funds before the launch of your product or service. The main advantage to it is the production cost at the time of launch gets recovered & a dedicated support is bagged which helps in focusing on how to further increase the product sale. Thus, getting self-funding is advantageous but only in the short term. If you stay away from external funding for a more prolonged time, then it becomes difficult to grab the opportunities from the growing market. WorkLoft, helps you out in all the above mentioned ways as we organize numerous events for start-ups to raise funds through angel investors, taking part in panel discussions which make you aware about the trends in the start-up vertical, week on week networking sessions which helps you interact with the other start-ups leading to a new learning every time. Join Work Loft & grow with us in all such aspects to get funded resulting in much higher revenue & market capturing! !